The categories of personal information we may collect from you include your name, mailing address, shipping and billing addresses, e-mail address, telephone number and credit card information. We do not provide your personal information to anyone except for companies that provide support services to us. 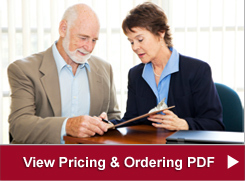 For example, we use third parties to help us process credit cards. These companies need some of your personal information to perform their functions, to fulfill your requests and to make your online experience more satisfying. You should also be aware that we may disclose specific information about you if necessary to do so by law or based on our good faith belief that it is necessary to conform or comply with the law or is necessary to protect the users of our Website, the site or the public. Iowa Memorial Granite Company uses a browser feature known as a "cookie," which is a small text file number that is stored on your hard drive when you begin to navigate at a Website. The cookies used by Krause Monument Company do not contain any personal information about you, but they may identify your specific computer. When you return to Iowa Memorial Granite Company, the cookie associates your computer with the information we may have stored from previous visits. Iowa Memorial Granite Company does not knowingly collect personal information from children under the age of 13. Should any parent or guardian discover that their child has provided personal information to Iowa Memorial Granite Company, please e-mail Polly Geurink, and Iowa Memorial Granite Company will make every effort to promptly delete the information. For your convenience, our Website may contain links to other Websites. 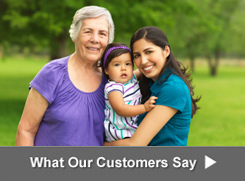 Iowa Memorial Granite Company is not responsible for the privacy practices or the content of such Websites. All content on this website, including, but not limited to, any advice that may be given to you over this website, are provided "as is: and all use of this website is at your own risk. Iowa Memorial Granite Company disclaims, and you hereby waive, any and all warranties and liabilities of Iowa Memorial Granite Company, whether express or implied, arising by operation of law or otherwise, with respect to this website and any content on this website. 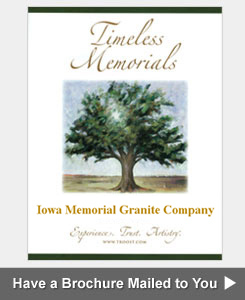 You acknowledge that Iowa Memorial Granite Company does not represent or warrant that this website will be accessible without interruption or that this website or the server that makes this website available are free from errors, defects, design flaws or omissions or from viruses or other harmful components. 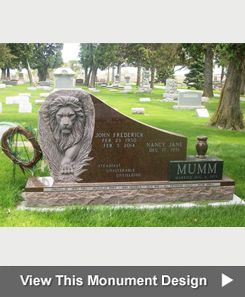 Iowa Memorial Granite Company does not warrant the accuracy, integrity or completeness of the content provided in this website, including any advice or other similar information obtained by you from us or through this website. Iowa Memorial Granite Company does not make any representation that the content provided is applicable or appropriate for use in locations outside of the United States.